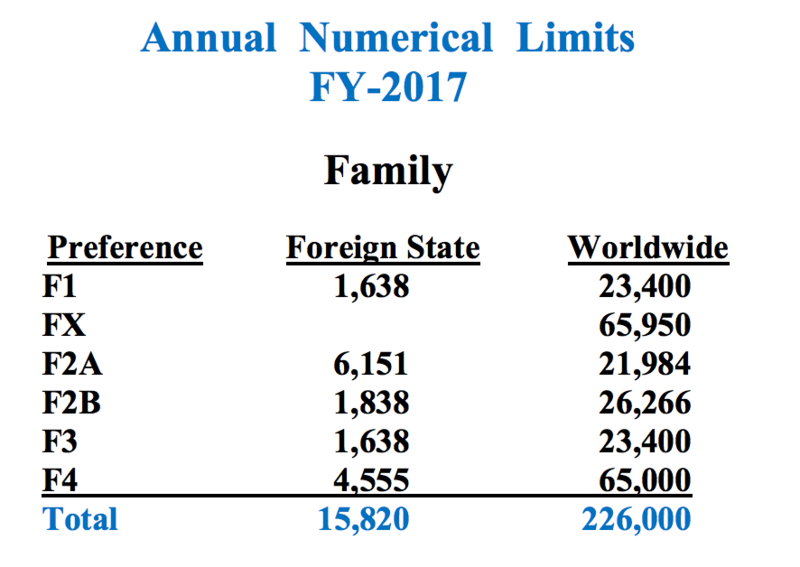 On December 12, 2016, the Department of State published the Annual Numerical Limits for both family and employment-based visa preference categories for Fiscal Year 2017. Family preference and employment immigrant categories are subject to numerical limitations and are divided by preference systems on the Visa Bulletin and become current based on the immigrant’s priority date. The Visa Bulletin estimates immigrant visa availability for prospective immigrants. Applicants who fall under family preference or employment categories must wait in line until an immigrant visa becomes available to them, for applicants to proceed with their immigrant visa application. Once the immigrant’s priority date becomes current per the Visa Bulletin, the applicant can proceed with their immigrant visa application. A priority date is generally the date when your relative or employer properly filed the immigrant visa petition on your behalf with USCIS. The Visa Bulletin exists due to numerical immigrant visa limitations for family-sponsored and employment-based preference categories established by the Immigration and Nationality Act (INA). Family-sponsored preference categories are limited to a minimum of 226,000 visas per year, while employment-based preference categories are limited to a minimum of 140,000 visas per year. The Visa Bulletin is a useful tool for aliens to determine when a visa will become available to them so that they may apply for permanent residence. To determine the number of potential immigrants, and by extension to allow for the imposition of numerical limitations, each immigrant is assigned to a country or foreign state of “chargeability.” Visa limitations are counted against the applicant’s country or foreign state of chargeability when the visa is issued or when the alien adjusts their status to permanent resident. Chargeability is sometimes called the immigrants “foreign state chargeability” or “foreign state area limitation.” Chargeability, along with the alien’s visa classification, is used by the Department of State to track allocation of visa availability and use of visa numbers. Immigrant visa applicants subject to these numerical limitations are generally chargeable to the numerical limitation that applies to the applicant’s place of birth. Unused numbers can “fall-down” from F1 to F2A to F2B to F3 to F4. Unused F4 numbers can “fall-up” to F1. These targets have been established by the DOS based on the historical and current patterns of number use, and are adjusted as necessary. The Chinese Student Protection Act requires that the China annual limit be reduced by 1,000. A total of 300 numbers are deducted from the E3 category, and 700 from the E5 category. The EW category is currently entitled to up to 5,000 of this total. Unused numbers can “fall-down” from E1 to E2 to E3. Unused numbers can “fall-up” from E4 and E5 to E1. These targets have been established by the DOS based on the historical and current patterns of number use, and are adjusted as necessary. 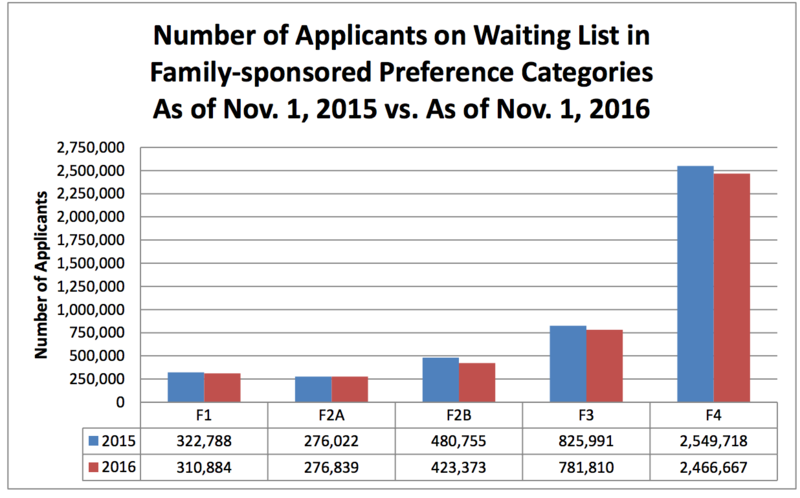 Additionally the Department of State released its Annual Report of Immigrant Visa Applicants in the Family-sponsored and Employment-based preferences Registered at the National Visa Center as of November 1, 2016. The data reveals that the Family Fourth Preference (F4) category for brothers and sisters of U.S. Citizens, and their spouses and minor children (U.S. Citizens must be at least 21 years of age) has the highest amount of demand of the family preference categories, and is subject to the longest waiting period. The F4 category is followed by the Family Third Preference (F3) category for married sons and daughters of U.S. Citizens and their spouses and minor children. The F3 category has the second highest amount of demand of the family preference categories and is also subject to lengthly waiting periods. These visa types are for specific, more distant, family relationships with a U.S. citizen and some specified relationships with a Lawful Permanent Resident (LPR). There are fiscal year numerical limitations on family preference immigrants. 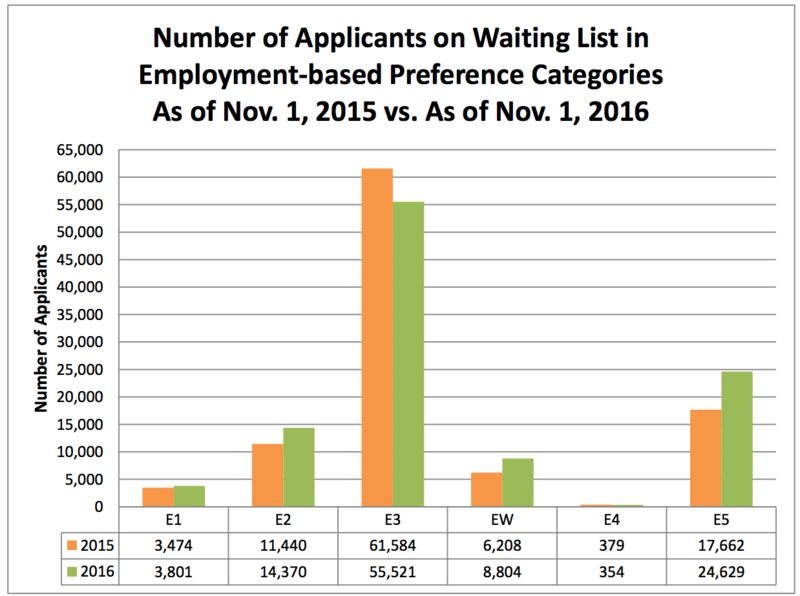 For the employment-based preference categories, the EB-3 category for skilled workers, professionals, and unskilled workers has the highest level of demand the longest waiting period. 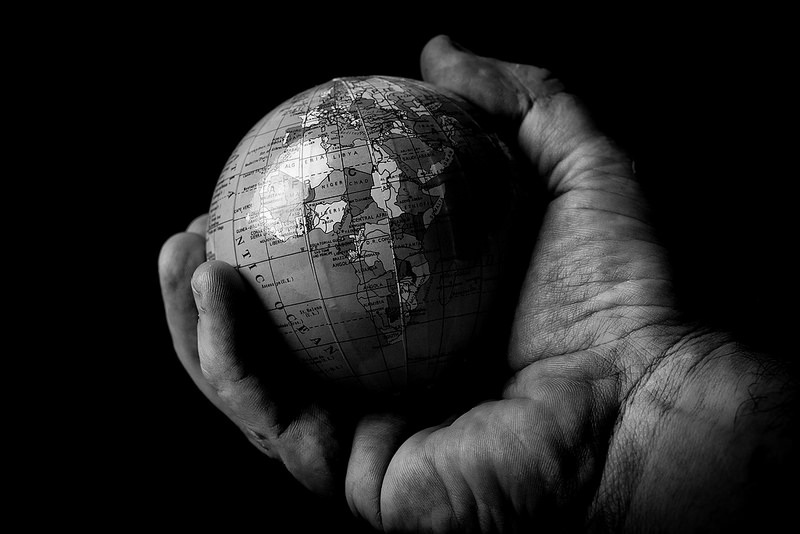 Skilled Workers, Professionals, and Unskilled Workers receive 28.6 percent of the yearly worldwide limit of employment-based immigrant visas, plus any unused visas from the Employment First Preference and Second Preference categories. Skilled workers are persons whose jobs require a minimum of 2 years training or work experience that are not temporary or seasonal. Professionals are members of the professions whose jobs require at least a baccalaureate degree from a U.S. university or college or its foreign equivalent degree. Unskilled workers (Other workers) are persons capable of filling positions that require less than two years training or experience that are not temporary or seasonal. Every fiscal year (October 1st – September 30th), approximately 140,000 employment-based immigrant visas are made available to qualified applicants. Employment based immigrant visas are divided into five preference categories. EB-1: Priority Workers: 28.6% of the worldwide employment-based preference level, plus any numbers not required for fourth and fifth preferences. EB-2: Members of the Professions Holding Advanced Degrees or Persons of Exceptional Ability: 28.6% of the worldwide employment-based preference level, plus any numbers not required by first preference. EB-3: Skilled Workers, Professionals, and Other Workers: 28.6% of the worldwide level, plus any numbers not required by first and second preferences, not more than 10,000 of which to “*Other Workers”. EB-4: Certain Special Immigrants: 7.1% of the worldwide level. EB-5: Immigrant Investors: 7.1% of the worldwide level, not less than 3,000 of which reserved for investors in a targeted rural or high-unemployment area, and 3,000 set aside for investors in regional centers by Sec. 610 of Pub. L. 102-395. To learn more about the visa services we provide please visit our website.